Two nights of eating dinner in a row?! What the heck. That really never happens. I’m not exaggerating. I got two nights in a row where I had enough time to eat dinner at work. A couple co-workers and I were in Lansing for the night and we were downtown near dinner time. There are plenty of options in downtown Lansing, but we were really close to one of my old favorites. Well, it used to be something different, but the spirit of the place is still the same. 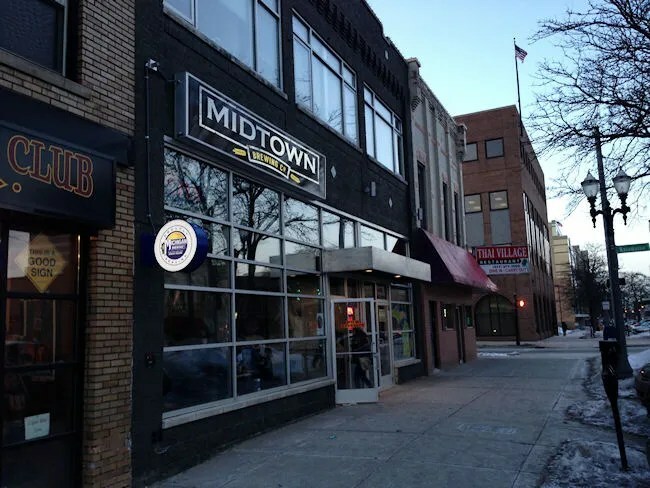 I’m talking about the Midtown Brewing Company which used to be MBC…which stood for Michigan Brewing Company ….before the parent brewery went bankrupt. The brewery and the restaurant were separate entities so the restaurant survived. After they ran out of MBC beer, they had to get a new liquor license and now they have several Michigan crafts on tap. 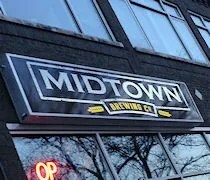 They changed the name to Midtown Brewing Company (0r maybe it’s Midtown Beer Company…I’ve seen it both ways, but the sign says brewing) to keep the MBC initials. My two co-workers grabbed a table while I put some things back in the car. When I got in, they had already found a table near the bar and ordered drinks. Since we were on the clock, there was no beer in our future, so we all had Cokes. The space looks like I remember it from my days in Lansing. It has that great rustic feeling with scuffed hardwood floors, exposed brick walls and the industrial look ceiling. 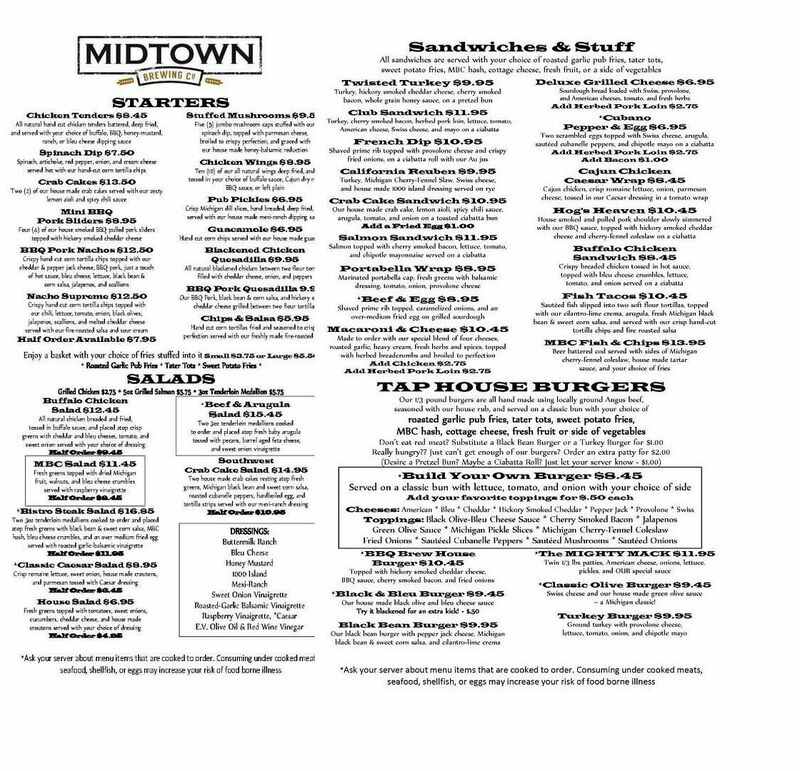 The menu seems to be pretty similar as to when it was Michigan Brewing Company, but seems to be a little bigger. I headed straight Tap House Burger section where I found the BBQ Brew House Burger. 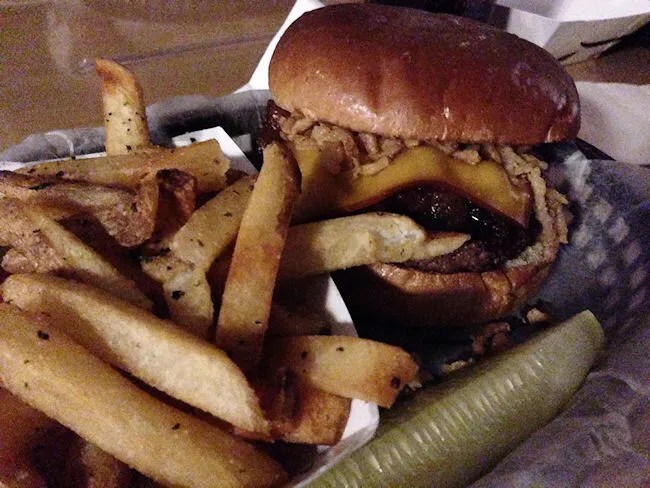 The 1/3 lb burger is made with locally ground Angus beef and mixed with with a house rub. The sandwich is served on a classic hamburger bun with hickory smoked cheddar cheese, BBQ sauce, cherry smoked bacon, and fried onions. I started to pull off most of the fried onions, but I pulled the whole slice of cheese off which was hiding two small pieces of bacon. It took me a second to realize what I had done…I thought they forgot the cheese and the bacon, but I eventually found it and put it bacon on. The portion of the bacon and cheese was a little small for the burger which was awfully delicious. The BBQ sauce was a sweet concoction that made it hard to put the sandwich down. The sandwich came with roasted garlic pub fries. The skin on fries had a slight garlic taste mixed in with the salt. As for my two co-workers, one of them ordered the Cajun Chicken Caesar Wrap. The tomato wrap is filled with Cajun chicken, romaine lettuce, onion, Parmesan cheese, and Caesar dressing. His wrap also came with the roasted garlic pub fries. He didn’t really say much other than it was good. He’s usually has pretty high standards, so just getting a thumbs up from him is usually a good sign. The other C.W. ordered a half order of the Nachos Supreme. These hand cut tortilla chips are topped with chili, lettuce, tomato, onion, black olives, jalapenos, scallions, and melted cheddar then served with a house made fire roasted salsa and sour cream. The half order was still way too much for one man and he ended up eating only about half. The bill for our three meals was just a little over $30. Midtown Brewing Company was the great dinner I was hoping for when we walked in the door. It would have been much better had I been able to drink, but just based on the food alone, MBC is a great spot when looking for a meal in downtown Lansing.